The twin tops of Green Side and Lord`s Seat lie in close proximity to the tiny village of Alwinton in Upper Coquetdale and are more often than not ignored by walkers as they rush up the nearby border-heading Clennell Street. Whilst relatively modest in height these two grass-carpeted neighbours enjoy superb all round views. 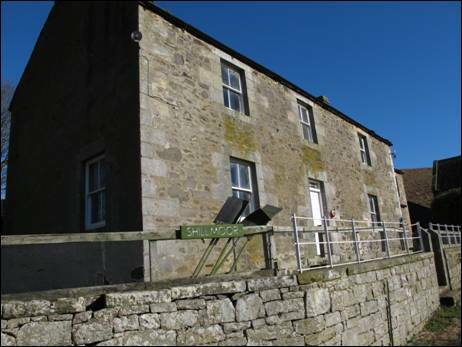 This lovely medium length walk starts on the banks of the beautiful River Coquet close to the farmstead of Shillmoor little more than 3 miles beyond the last village (and pub) in Coquetdale. After a gentle first half hour or so, the route rises dramatically up the historic Pass Peth before then continuing on an upward trajectory to the two main tops of the day. The route then drops steeply to the secluded valley of the Hosedon Burn before heading to the higher ground of Castle Hills and thence up Clennell Street as far as the slopes of Saughy Hill. From here you will descend by a little-known track to the splendid Usway Burn where an easy water side meander soon delivers you back to the River Coquet. A day to remember can be all but guaranteed. 1. In her 1948-published book, `Northumberland`, Ann Sitwell described the River Coquet as being, “perhaps the most loved of all Northumbrian streams”, and its valley, “as varied and interesting as it is lovely”. Nearly 65 years have passed since those dark days of food rationing yet the River Coquet remains as loved and as lovely as it did when Ann Sitwell put her thoughts down in writing. Once you have passed through the handful of buildings which make up the village of Alwinton the narrow single track road climbs across the lower slopes of both Lord`s Seat and Green Side before dropping abruptly to the sheltered farmstead of Linbriggs. Once across the impressive arched concrete bridge, built in 1928 and the first in a 40 year bridge-building programme in Upper Coquetdale, the road winds uphill away from the river and the views ahead begin to open up. A short descent later and the road returns to the banks of the River Coquet with the buildings of Shillmoor close by on the other side. Just before the road reaches the next bridge, built in 1932 and replacing an old ford, there is ample space to park your car on the right hand side (GR NT884077). Before you begin your walk a quick glance at your Ordnance Survey map will reveal, a mere 600 metres upstream, an outcrop abutting onto the road called `Kateshaw Crag`. A few metres before reaching this outcrop there is a stretch of deep water where, according to David Dippie Dixon in his 1903 book, `Upper Coquetdale Northumberland Its History, Traditions, Folk-lore and Scenery`, “an unfortunate policeman was drowned whilst bathing; hence the pool has since been called `Policeman`s Hole`”. Unfortunately, this thought-provoking name does not appear on the current editions of the Ordnance Survey map. Now, with everything you need for a fine day out in the hills packed neatly into your sac, head up to the bridge and, once across on the opposite side, turn sharp right to pass in front of two, stone-faced semi detached houses on your left. 2. A, “comfortable well-to-do-looking farm house”, was how David Dippie Dixon described Shillmoor back in 1903 but sadly the farmhouse, reached soon after the two semi detached houses and now used by the MoD for troop training purposes, has lost much of its shine. 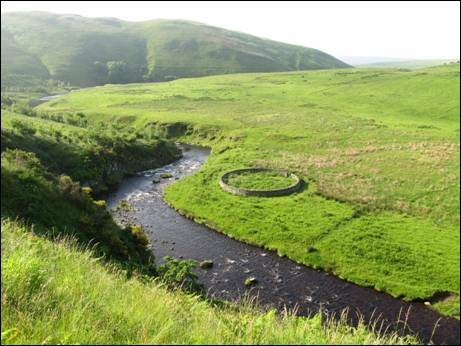 However, its situation, extremely close to the confluence of the Usway Burn and the River Coquet and surrounded by green, rolling hills, still makes its location hard to beat. Keep to the river side of the house and the farm buildings and, once you have passed through the large metal gate, cross the Usway Burn via the relatively new wooden footbridge a few metres to your left. You will meet up again with this delightful burn towards the end of your walk. 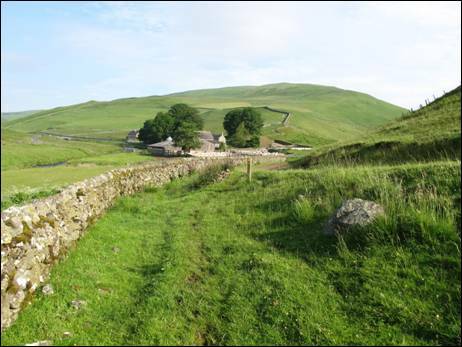 Once over the bridge bear to your right and follow the rough track as far as a small directional marker post close to a fine drystone wall. Now leave the track behind and follow the thin green path which keeps close to the wall. Soon you will reach, immediately after passing through a small wooden gate, a new footbridge across the Wholehope Burn. This tiny burn, which cuts a deep cleft through steep grass-covered hillsides, rises close to the point where your walk leaves Clennell Street, later in the day. Much higher up the burn from where you now stand lie the well-hidden remains of an illicit whisky still which was, in all probability, in use as long ago as the late 17th century. Continue to make your way along the narrow path as it contours the curiously named The Knocks. Below you, to your right, the River Coquet slips past in a series of gentle bends whilst ahead the now clearly-visible diagonal Pass Peth will begin to occupy the mind. 3. Continue to follow the path as it passes through a relatively new plantation and then begins the steep climb up the north west facing slopes of your first hill of the day, Green Side. 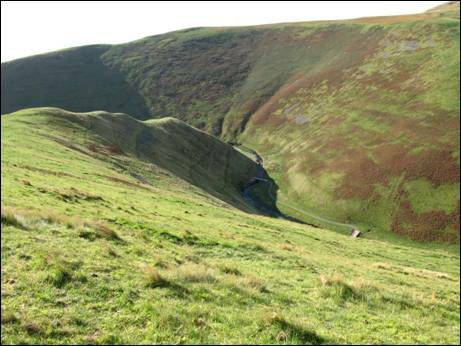 This path was described by David Dippie Dixon as, “nothing more than a sheep-track overlooking the linns, to be trod only by those possessed by a sure foot and a clear head”. Presumably, the path, which is now wide enough for a quad bike to pass along, was somewhat thinner in 1903! Now rapidly gaining height and high above the River Coquet the views over Upper Coquetdale are outstanding. Inevitably, you will pause occasionally to admire the extensive panorama until eventually you reach the small col between the summit of Green Side, to your left, and its small spur, immediately to your right (GR NT897068). Here, some four centuries ago, the men of Upper Coquetdale kept watch, night and day, guarding against the incursions of the Scottish free-booters. Now, as you stand next to a directional marker post, turn to your left and head uphill following the faint quad track as best you can. 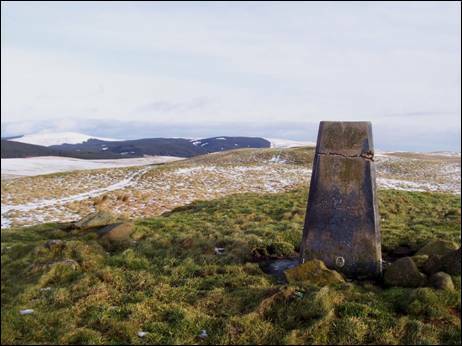 Soon the triangulation pillar on the summit of Green Side will come into view ahead of you. Standing at a not altogether impressive 389 metres (1276 feet) above sea level this top nevertheless enjoys fine views. The pillar, as you will now doubt notice, has a substantial crack running through it and it is not unknown to arrive on this quiet summit to find the top portion of the pillar lying next to the base. Re-join the quad track and continue in the same direction of travel. Soon you will be accompanied, on your right, by a post and wire fence which, in turn, reaches a cross fence and a gate standing next to a small boundary stone to your left. Head through the gate and stay with the track as it climbs to the cairn-capped summit of Lord`s Seat, some 3 metres higher than its next-door neighbour. Once again there are fine views to be enjoyed especially towards the valley of the River Alwin and the adjoining Clennell Hill, Silverton Hill, Puncherton Hill and Weather Cairn. 4. The next section of this walk requires some concentration as there is, initially at least, no discernible path to follow. In misty conditions it is easy to go astray. So, turning to the south, make your way gently downhill over mixed terrain and before too long you should begin to see the deep cleft of the Hosedon Burn ahead. You should also spot the main valley way below along with a fine example of a round Northumbrian sheep stell. Beyond, stand the impressive twin-tops of Castle Hills. Your route turns ever-so-slightly to the left, with the cleft of the Hosedon Burn now to your right, as you take aim for an obvious bracken-covered shank and the thin thread of a downward heading path. The path, in so far as you can follow it, will ultimately lead you to the junction of the Hosedon and Alwinton Burns (GR NT915072). This is a fine and secluded valley where the hills, because of their close proximity, seem higher than they actually are. You must now head towards and then past the stone sheep stell finding a route which suits you best. The underfoot conditions are on the rough side and, in all but extremely dry weather conditions, potentially pretty wet. You will, inevitably, need to cross and re-cross the burn on a number of occasions as you proceed nimble-footed downstream as far as the metal gate. Once through the gate, follow the narrow hillside-climbing path which heads diagonally towards the saddle separating the two tops of Castle Hills. Once there, catch your breath, then climb to the top of the rocky promontory to your right (GR NT918069) where you will enjoy a superb view of the valley you have just passed through. Perhaps this will be a perfect spot to refuel. 5. After you have finished your lunch, leisurely or otherwise, return to the saddle and continue more or less straight uphill to reach the main top of Castle Hills. Also known as Gallow Law for obvious reasons, this oval-shaped hill contains the remains of an Iron Age hillfort consisting of a single rampart enclosing an area approximately 170 metres by 60 metres with an additional internal rampart around the western side of the hill. Take the time to explore the summit and to enjoy the panorama before returning, yet again, to the saddle. Once there, turn to your left and follow the boundary wall and fence, lying on your right, as far as the metal gate and the adjoining ladder stile. This is Clennell Street which, if followed downhill, will bring you fairly quickly to the village of Alwinton. However, your route lies uphill to your left. So, without further ado, off you go, first passing around the base of Castle Hills and then turning more sharply uphill with the dwelling of Clennellstreet away to your right. The route is straight forward and has been well utilised over the centuries by a plethora of travellers of various shapes and sizes. It is now classified as a `Restricted Byway`. In time, you will arrive at a gate and a small stile. 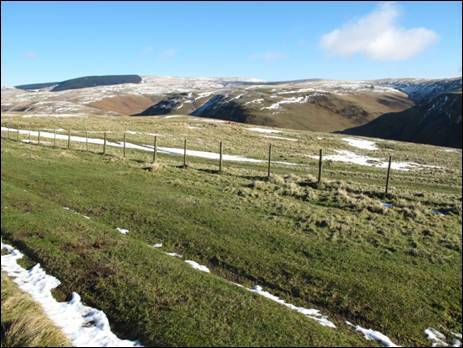 Ahead lies Uplaw Knowe and your way forward continues to follow the clear track which slips across the north facing slope keeping to the right hand side of a boundary fence when eventually reached. The track then heads along the mature edge of the Kidland Forest before climbing uphill to the reach a tumble of stones with a corrugated shed immediately behind (GR NT901093). 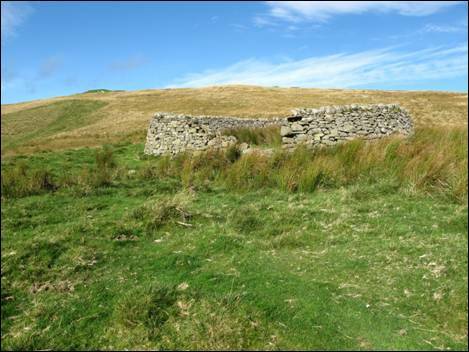 These stones are all that remains of the former shepherd`s cottage of Wholehope, purchased by the MoD in 1941, subsequently falling into disrepair then, after being made reasonably habitable by volunteers, opening as a basic Youth Hostel in 1949. It officially closed in 1965 and was more or less demolished during the 1980`s. 6. Now continue on, over potentially puddle-strewn ground, past the corrugated shed and across the tiny trickle of the unnamed watercourse which has barely started its journey through Kidlandlee Dene, to your right. Eventually this watercourse tumbles into the River Alwin immediately below the slopes of The Dodd. Next you will join an uphill-heading forest track which, in a very short distance, reaches another slightly broader forest track. Ignore the track as it heads to your right and ultimately to the Alwin Valley, and walk slightly left through a part-harvested area of what is the vast Kidland Forest. First planted between 1953 and 1987, the forest covers some 2,100 hectares (5,190 acres) of land of which 1,200 hectares (2,965 acres) are in the ownership of the Forestry Commission with the remaining hectares being in private ownership. Second generation planting commenced a number of years ago. Eventually, with a relatively new area of planting on your right hand side and open hillsides to your left, watch out for a path on your left (GR NT897106). This path, which is clear on the ground, makes its way towards a fence which runs along the southern slopes of the obvious Saughy Hill. It can be exceedingly damp in a number of places. Continue as far as the circular stone sheep stell which lies on your right and immediately before a small stile across the post and wire fence on your left. 7. To your right lies a reasonably quick and easy route to the flat, grass-covered top of Saughy Hill, a 494 metre (1621 feet) high hill of little intrinsic interest other than for the fine all round views. If time and energy levels permit, you might just be tempted to make the short out and back journey, via the obvious quad track which begins close to the stone sheep stell, to the unmarked summit. A trip perhaps for the record only although, once on higher ground, a further exploration will reveal the option of an alternative, and exciting, descent to the valley of the Usway Burn. Maybe something for another day! Now cross over the small stile and head along the track which follows the route of the public footpath towards Copper Snout crossing first a small rise before then descending slightly to join another, more substantial track with an adjacent directional marker post (GR NT890095). Turn right and then, after a mere 30 metres, turn right again onto a subsidiary quad track which, ever so quickly, will offer you some stunning views downhill towards the Usway Burn and straight ahead to the combined bulk of Inner Hill and Shillhope Law. Elsewhere there is a vast photogenic panorama stretching all the way to the high level border with Scotland. As you head downwards, keep with the track ensuring, once you have reached the 350 metre contour, to turn alongside Spit Hopes, on your left, rather than head straight on over a very seductive series of small rapidly downhill-running humps and bumps. Eventually, you will reach the banks of the Usway Burn alongside a fine looking bailey bridge (GR NT885087). The natural route back to Shillmoor, some 1.3 kilometres away, is to cross over the bridge and then to stay with the rough track all of the way back to the River Coquet and the end of your walk. 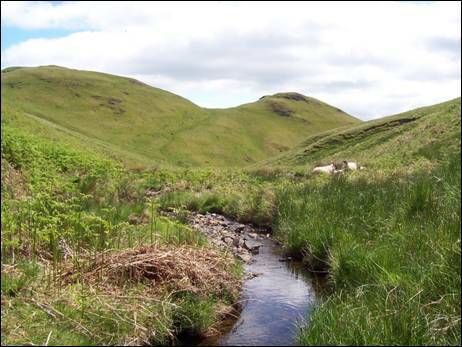 However, a far better option is to stay on the left hand bank of the burn and to follow this delightful watercourse downstream keeping, in so as it is visible on the ground, to what is part of the Pass Peth route you took at the beginning of the day. By doing so you will be able to see close at hand the numerous small waterfalls over which the Usway Burn tumbles on its way to the River Coquet. The way is straight forward just keep the burn to your right and the steep hillside to your left until you reach the small wooden footbridge you crossed a few hours earlier. There is no scope to go astray! Re-cross the bridge, turn slightly left and go through the metal gate. Now it is a simple matter of heading straight on past Shillmoor and the two semi-detached houses. Once at the bridge over the River Coquet turn left and, as they say, `Bob`s your uncle`! Mainly good paths/tracks although intermittent in one or two places. A few steep ascents & descents. Two extremely short stretches of tarmac.